There are many opportunities for duck and goose hunting in southeast Texas. The coastal marshes and waterways along the southeastern coast make ideal stop-overs for migratory waterfowl, and the warm, sunny climate is a welcome break from the cold, snow and sleet often associated with more northern hunting. Hunting geese in southeast Texas offers birds from both the Mississippi and Central flyways, so there is always a good population of many different species in the area during hunting seasons. One of the advantageous of southeast Texas as a location is the wide variety of food sources available to the migratory birds. This area must seem like a mecca to ducks and geese as there are corn fields, rice field, grain and bean fields that are flooded annually, providing the perfect conditions for tired and hungry migratory birds to stop over and refuel for the next leg of their journey. Duck and goose hunting includes the use of dogs, traditional blinds and decoys as well as flags and calling in the geese. If you use a professional guide or goose or duck hunting guide service most of these items will be provided for you, all you will need is your license, appropriate stamps, guns, ammo and waders. This all in one service is ideal for those that travel to the area for the hunt and don’t want to have to bring all their gear and supplies. 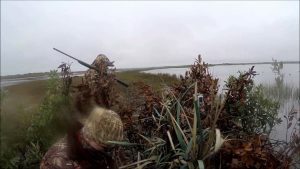 The guides and professional that offer the best duck and goose hunting in southeast Texas are interested in keeping hunters coming back to use their services year after year. They spend hours every afternoon and even in the pre-season to find the patterns the migratory birds are using, which fields they are feeding in and the times that they are moving about. Usually most services offer hunting in the morning, just at sun rise, then end at about noon to give flocks a chance to feed without being disturbed in the afternoon. This keeps the waterfowl in the area as long as possible. For sportsmen that are flying or arriving from different locations most of the guides offer accommodation through lodges or hotels in the area. They can arrange to pick you up at the airport or other locations and can even assist in obtaining licenses for out of state hunters. If you are planning on duck or goose hunting and are from another state or country be sure to inform your guide so they can arrange to get you licenses when you arrive. This will avoid delays and any possible problems that may delay your hunt.